Sparco Helmet - Prime RJ-9i Supercarbon UNIVERSAL - Dezod Motorsports Inc - Home of the automotive performance enthusiast since 2002. The Prime RJ-9i helmet has FIA 8860-SNELL2015 type approval. 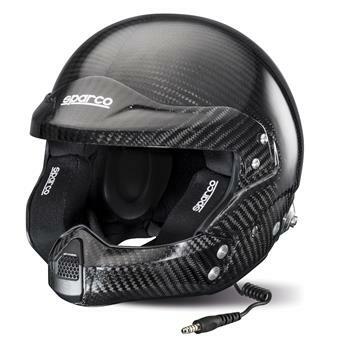 Its resin-coated carbon fibre shell is reinforced with carbon-kevlar. Thanks to this manufacturing technology, the lightweight Prime RJ-9i carbon fibre racing helmet has excellent resistance. The shell and polystyrene padding of the Prime RJ-9i helmet are extra thick and are designed to ensure excellent ventilation, while the interior linings can be removed, washed and repositioned. The supercarbon Prime RJ-9i comes supplied with a professional communications system (adjustable carbon fibre boom, noise cancelling microphone, high quality speaker) and military grade connections (Nexus connector). The Prime RJ-9i comes supplied with fitted Hans® clips. Available in 6 sizes XS, S, M, M+, L and XL, and in carbon color.